I hope everybody is having an excellent Valentine's day! I used to hate this day to my bones (long sad story that I will share in another time) ... but now that I have my wonderful family I love this day and I enjoy it a lot! We've been celebrating since yesterday (A free Sunday sounds much better than a busy Monday) and both my daughter and I received chocolates and LPS Blythe dolls... now we can play together with them! We also baked yummy chocolate cupcakes with cream cheese frosting and pink sprinkles... the frosting HAD to be blue (my daughter LOVES blue and she insists everything she makes or gets is that color) and she took them to share with her classmates. So to continue to the giving spirit... let's have our first GIVEAWAY for the year!! (yay!). I'm not sure if you noticed but recently I introduced to my shop new sizes of Wood Mounted Prints. First I had 5x5, 5x7 and 3x6 inches, now I also have 8x8, 6x8 and 5x10 and very soon 2x2"! The winner will get to choose the image and size of Woodblock she desires! How cool is that? If you want to participate just let me a comment from today until Friday 12:00 pm East telling me how you celebrate Valentine's day and your choice of image and size (you can take a look here to see what's available, but It can be any of my available images). The winner will be announced this Saturday. If you tweet it, mention it on your blog or facebook and paste the link here you'll have an additional chance for every entry.... Let's spread the word and start picking your favorite! And have a beautiful, wonderful, filled of love day! This year I'll spend Valentine's Day cuddled up on the couch with my hubby. He's sick, and I'm 8 months pregnant, so we won't be doing anything too crazy. Happy Valentine's Day! LOVE the wood mounted prints, such a great idea! Me and my husband try and fit in some romantic time every Valentine.....it gets harder every year as my 9 yr old has an inquisative mind.lol. This year i have offered a full massage with the new body oil i bought him for xmas!! My husband bought me a beautiful bunch of flowers and my favourite choccies. Happy Valentines Day to you and your family! My daughter and I got LPS Blythe dolls for Christmas lol! :) I love your art work and have a few of your pieces and I would be thrilled to win! Have a nice day! Well, we don't really celebrate Valentine's Day here in Israel. If we did, I would spend a quiet evening at home with my boyfriend. My favorite print is Blue Haired Girl, and my preferred size is 8x8. Thank you! Wow Danita what a wonderful way to start off Valentines Day! Well I usually spend Valentines day working, I'm a massage therapist and it's always a busy day on Valentines. But my favorite way to spend the day if not on the actual day is with my Hubby. We usually have a nice dinner, Italian seems to be my favorite on valentines. Followed by a chocolate dessert. I really love all your artwork but one of my favorites is Isabella. your pictures are very pretty - i love your paintings. today at my school for Valentine's Day we gave cards and treats to each other - We had a Valentine's cookie sale and I bought some for my friends. I love your art and am torn between "The Hug" and the "Woodland Parade". I like the 5 X 10 size but the 3 X 6 size seems neat too. Thanks for the nifty giveaway! Love all the new sizes, expecially 8x8! Thanks for helping to celebrate Valentine's Day with a great giveaway. This is a wonderful giveaway Danita! And I love your Blythe dolls, so beautiful. I spend Valentines Day with my son who has a day off from college. I made him spaghetti and meatball for lunch, his favorite meal and then we hung out and chatted. He's the best son ever! Tonight I'll be making dinner for my hubby and giving him a gift I picked out for him...hope he likes it! I love the I Owl You Forever print in 6x8 (but any size would be wonderful). Thank you and Happy Valentines Day! oh, I forgot to say how I celebrate- We usually get take out and a movie and veg out in front of the TV watching movies with our kiddo! Hi Danita: I absolutely admire your work and creativity. Thank you for wonderful blogs. I spent Valentine's alone. My husband is deployed in Afghanistan and I sure do miss him. We didn't even spend this last Christmas together - so two special days without him and more to come until his tour is finished. But what brightened my Valentine's Day 2011 was the card I received from my husband right on the special day - what timing when I need it most. And as I read it I felt his presence. It was very special. woohooo your work is always so amazing! spending family with the hubby and two boys, heart shaped pancakes for dinner and some chocolates after! I would be happy with any print of yours-any size! thanks for the chance and Happy Valentines Day to you and yours! Happy Valentines! My husband and I usually give cards and a hug, and try and cook a nice meal together. Once upon a time we would have gone to a movie, but now with a 20 month old, we stay in and watch one! LOVE woodland parade 5 x 10! I think I would ask for "I Dream of Flying" in a 6 x 9 for a friend of mine but I LOVE them all and would take any of them! As a teacher I use Valentine's Day as a great reason to let the students do an art project. Regardless of the student's ages or grades, I find a way to let them express themselves creatively. Today my 7th grade writing student's wrote letters to a loved family member and then made cards and envelopes to send the love in! always a fan. Saw this over at FB. Glad to see your new stuff daily. Thanks for the sweet giveaway this Valentine's Day..thanks for sharing the LOVE. Every year we decorate our table full of Valentine's Day goodies. My husband, daughters and I make heart-shaped pasta with Alfredo sauce, meatballs, and Italian sausage. After we eat dinner, we exchange cards and tell each other why we love each other. Of course, it is all followed up with chocolate covered strawberries. Yum! I love your mermaid picture, so my favorite size is the 5x10 for sure! i love the line of animals!! wonderful! today- eating chinese, choc oreo cupcakes and chilling. oh, yea. such a sweet offer - i must join in. although i spent my day working today...i was not expecting the delivery that came around noon. a box of beautiful tulips from my 21 yr. old son with a card that said i would always be his #1 valentine. he has written me these sweet words for years, and i could not contain the tears as i saw them again. i was missing him terribly as he is away at school...and this just brought him back to me in the sweetest way possible..and i'm ending my day listening to his basketball game being broadcast online! too cool!! hope your day was sweet too! I have to say, those teeny-tiny woodblocks are absolutely adorable! 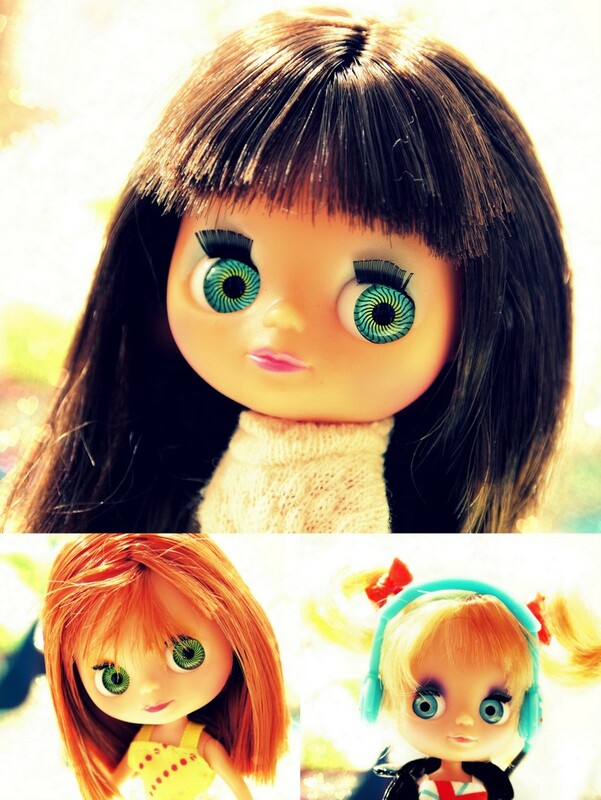 Your tiny Blythe dolls are adorable. I hope you all had a very happy Valentine's Day! We usually get our girls a one special thing on Valentines day. Maybe some jewelry or a keepsake of some kind. But this year, we went a little unorthodox on them and bought some rugs. :) They love to play with their little LPS toys on the floor and pretend they are on roads and traveling here and there. So we put a big red bow on two big rugs with an interactive street pattern. One is a farm scene and the other is a city scene. No chocolates this year, or conversation hearts. Just rugs. But they were in heaven! They've been playing quietly ever since! I am a HUGE fan of your work. I've had my eye on your pieces on Etsy. Your style is so unique. I love it. I'm asian, and some of the girls you depict in your pieces look like my daughter, so it always makes me smile. I love it. If I were fortunate enough to win, I would LOVE the "All you Need is Love" or "Globetrotter"
Great giveaway!! have a lovely day! LA FRIDA EN ROSA reminds me of beautiful MEXICO... oh, I do wish and hope I could win such a wonderful Valentine from you Danita! Today I spent a HAPPY HEART day with my husband, who took me out for Chinese buffet ~ much nicer to have an outing like this than to another doctor appointment which is all I ever get, disabled 11 YEARS from bug bites I got on a mission trip to Chiapas in January, 2000. I have NO REGRETS; I would do it again in a heart beat. HUGE HUGS! So hard to choose - I think The Baker on the 8x8 would be my choice. Thank you for the chance to win. Danita oh Danita where ART my Danita....maybe a little weird but you are my inspiration lady. I think even though I only read your words through here your art tells all about you, who wouldn't love someone so colorful? Valentines Day has been spent going to college, and doing homework all afternoon and evening...so fun. But I feel content and that is all that matters right?We did start the morming with the kiddos curled up in our bed passing around V cards, it made the day sweet. Have a wonderful one! To celebrate we give gifts and go out to lunch together. It is my favourite day! I love Bird Talk and well ... all of them to be honest! Hello Danita and Happy Valentines Day! First, I'd like to tell you that I think you are an amazing artist. I admire your art. Also, you are self taught which mneans you were born to paint/artist. If I win... I hope I win.... I would like "The Seamstress" wood block 5 X 10.
wow, these are so cute! i love the valentine parade and anything frida. i love it all, really! :) happy valentines day! what a great giveaway. I celebrate Valentine's Day with who ever is free to come over for Coffee and cake, because Valentine's Day is my Birthday ! I love heart and Valentines and people having lovingly days. We didn't celebrate. Hubby is having surgery today so he was on clear liquids. So I ate a salad in another room and the kids just had a sandwitch. Maybe we can have a nice dinner at another time! The prints are beautiful! I hope you had a better day than mine!! Wow, Danita, what a generous offer! It would be cool to bring your art to Europe! I´m like a little Valentine´s Day revolutionary, I don´t like the pressure that is put onto this date. You NEED to do something fancy, you NEED to buy fllowers, and you are surely to be unhappy when you are single, as everyone else is "showing their love". I think Valentine´s Day provokes more misery than joy through the fact that it is the day for the love of you partner, not for the love you have for youself or anything else. Like flowers, furry friends, art and other passions. Being a mori girl, I am a huuuge fan of the Woodland Parade in 3x6 inches! That would be wonderful!!! This year was spent eating sushi in a hospital room. Its all good though, I was there because baby #3 was born the day before. One of the best V-days! This year I spent Valentine's Day with my Sister during the day, and then in the Evening I went to a Spiritual Awareness Class, and came home to a friend suffering from a bad back, so cups of tea and sympathy all round, lol. Oh, I wish I can win your artwork! i love to bake sweet cupcakes and layer cakes for valentine's day.. my husband will take the cupcakes to work and i make him a special heart cake!! weeks before, i make collage cards and maybe a few paperclay dolls to send or sell...i love the sentiment of valentine's day and love to put out vintage cards from years past!! Danita Art is such an inspiration to me and i love the little group prints on wood...!! Valentine's Day is usually a bit low-key for us. I get my kiddos a small gift , a book or a cutesy notebook, and that's about it! I love your work, and all of the prints I have from your shop. I love the 5x10 Valentine Parade and I think Candy Girl would be great in a 6x8. Thanks for the great giveaway! I spent Valentines Day with my sweetheart of a husband. He bought me wine and Godiva dark chocolates! 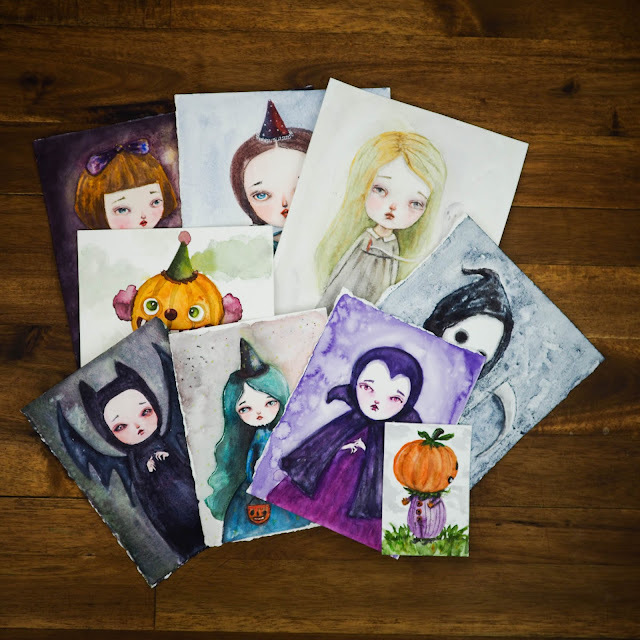 I would so love to win one of your charming prints!! Danita, I loved to hear about the giveaway. I love "Bird Talk". On Valentine's Day (here in Brazil it is celebrated in June)my husband and I usually have lunch together at a fancy restaurant. I love it! We drove over to the Eastern Shore to the lovely historic town of Easton, Maryland. My husband needed to see a gunsmith about doing some modifications to a 50 year old shotgun that he uses to shoot sporting clays. It turned out that the appointment took about two hours! The gunsmith was wonderful and a wealth of information. At the end of the appointment I said, I can't wait to tell my girlfriends what a wonderful Valentine's Day I had at the gunsmith. We all laughed. Afterward on the street, I asked a woman to recommend a place for lunch and she sent us to Scossa an Italian restaurant. It was amazing, we had wine, caesar salad with white anchovies, tomatoes and mozzarella, an assorted antipasta plate, lobster stuffed ravioli, crepes with a vanilla sauce, chocolate sunken cake, cappuccino, yum! Later that night we stopped at Redbox to rent a film, picked up steamed lobsters and potato chips from a local seafood store, cookies from a bakery (it was too late in the day, the pastries were sold out) and finished the day with a quiet meal at home with a movie. It was a wonderful day together and my husband said the best Valentine's ever! Frida Between the Curtains in 3 X 6 would be lovely! I'm so happy you are doing this giveaway, and I hope hope hope I win one of your lovely prints! I've loved your art for a long time. It's so hard for me to pick just one of your prints, but I would love to own the Baker in the 5x7 size. :) She is adorable! what a wonderful giveaway treat! i have been a fan of yours since i discovered you on etsy-my first etsy purchase was one of your "sirenita" prints, and she greets me every morning at the coffee pot! valentine's day is pretty low key here, but i did have a great visit with my mom. soooo...winning your giveaway would be a great treat! i love your wood mounted pieces and would definatly have to choose isabella! Personally I'm not big on Valentine's Day but I do enjoy getting into the spirit for my kids sake. That usually means baking up yummy treats like cupcakes with sprinkles, milkshakes with sprinkle rimmed glasses, heart shaped pancakes with whipping cream for breakfast.... and being a crafty gal I always make them a valentine from Mom. I love so many images it's hard to choose which I like best! My son is the only sweetie in my life right now so it's all about dinner, a chocolate treat, and a kid-friendly movie. What's better than that?! I would pick the Woodland Parade 3x6. You are SUCH A TALENTED ARTIST. Your work brings such a big smile to my face and believe me I needed one cuz my mother died last week. So thank you my love. they are all incredible Danita! wow! I think Bird Talk might be my fav...size doesn't matter here!! if i everhad a chance to win, i would let youpick one for me. i love everything youdo, so i would be happy with any of your gorgeous art. I spent a quiet evening at home, having take-out and tiramisu for dessert, perfect. my daughter's birthday is the 13th so we always spend the 13th and 14th together as a family. I love your darling illustrations Danita. I especially like your I OWL You print!! I'd loved one of your little prints, They are so sweet. This Valentine day spent together with children, eat and play. This year my family and I celebrated an early Valentine. We enjoyed a beautiful hike at the Big Santa Anita Canyon here in California. We took a lot of pictures, enjoyed the beautiful scenery and had a delicious picnic at the end of our hike. It was the perfect day! Monday was unplanned. My love surprised me with a beautiful hand crafted flower arrangement he learned from a Martha Stewart project. It was a quiet but loving Monday with my family. I would love a Frida print. I love them all so I can't pick one specific but your Frida art is my favorite. As for size...I think a 5 x10 would be great. P.S. I love your new banner. My husband and I started celebrating Valentines day last Thursday which was my birthday, so we had a full weekend filled with LOVE and admiration. Hi Danita, I just discovered you and your blog through the Where Women Create Book of Inspiration. I love your work. As I am unattached, i bought myself a lovely chocolate for valentine's day - and then my gorgeous niece arrived with a beautiful card a and a heart lollypop with 'i love you' written on it. I am very blessed! I so love your all of your woodcuts, but i think i would choose 'lucy in the sky with diamonds'; beautiful! Oh my, what amazing creations! I would love the seamstress print on a 8x8 block. Thanks so much for the chance. Well, I used to get all fancy with the decorations, and make new things.... now I'm lucky if I remember it's Valentine's DaY! There are usually too many sugary sweets involved. Almost always a lemon pie for my valentine. This year I made snack bags for my little ones - and we painted little wooden hearts... or scribbled on them. I love your cart with hearts girl - 6x8. This year I had a quiet dinner with my husband, and I made fish, which we both love and I don't serve much because my daughter hates it. She was out having a lonely hearts dinner with any girlfriends who are currently without boyfriends. I think she had more fun with them than she would have on a romantic dinner with a boyfriend -- isn't that always the way? I love the woodland parade - in any size. Yor work is lovely! love your shop!! I just bought the baker for my daughter. I love the new on the train piece. I spent Valentine's Day cozied up with my hunny watchin a movie, eating the chocolates he bought! I'd love any size..the 5x10 would have a place of honor near my desk!! Oh how I would love to win one Danita! You are such an inspiration to me! We take the day off and spend it at home making art! What a generous giveaway! I love the 8x8 "Over Coffee" and the 6x8 "I Finally Found a Friend" but truthfully ALL of your art is so magical. As far as Valentine's Day goes ... Hubby and I celebrate the anniversary of the day we met instead :) Thanks for this opportunity ! !